You’re always 1 step ahead! Many thanks – You Guys are just Brilliant – you have a great team there – It’s a tough competitive business climate, so glad to see you growing yet giving super-fast support. I wanted to say how GRATEFUL I am for Super Ray and the DLIT Team! I had a serious error on my laptop on Saturday evening and Ray responded in super quick time on a SUNDAY and not only that but he kept me updated throughout the process even texting and calling me on a Sunday evening! This morning (Monday) I have a super quick and fully repaired laptop awaiting me on my desk. This is FANTASTIC. THANK YOU! I have just spoke to Phil Maddock and said that I am aware that we pay for a service however I do believe that at times when Carole and I have issues when working from home members of the DLIT Team have gone out of their way to help us. DLIT have been our IT Support provider for over 6 years and we have been DLIT’ed (Delighted) with the service they provide. The TBKS team have total confidence that DLIT will deal with any IT issues quickly and professionally which is reassuring as the operation of our IT System is business critical. DLIT Support Team, Admin and Sales are a pleasure to deal with, on every level, and I have no hesitation recommending DLIT as a first class IT Support Provider. I always recommend you to anyone who asks anything about IT. You guys are so easy to deal with and so helpful. I’m very glad I switched to you. The most ‘human’ IT company I have come across. As a small business owner I have really struggled to find good IT support for my business. DLIT are responsive, helpful, take time to explain technical issues in a way I can understand (without all the technical jargon) and charge a reasonable fee. They are also really decent people and go the extra mile to help you out if things go wrong. We have been using DLIT now for 15 years and have always found them to be very professional in their approach to our business. We allow DLIT direct control into our servers and much of the problems we incur are carried out remotely. I have to say that up until this minute any problem we have with our computer system they have fixed at a very quick time (even outside normal working hours when we can afford our systems to be down). I find their prices very competitive for all our computer needs from software to hardware and the general maintenance. If they say they are going to do something for us they always do. Once again I cannot recommend them highly enough. We are very happy with the professional and reliable service you have provided over the past 6 years. (and the years before for that for me when I ran The Southville Centre). Many thanks again to you and Ray and your lovely team for your quick response and support with our IT needs. As far as our history with your company goes, we have found you nothing less than exemplary and so it is with every confidence we would ask you to arrange the moves for us. We have been using DL IT Solutions for all our requirements since 2003. 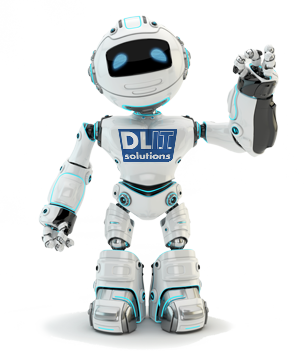 The team at DL I.T Solutions always display a professional, approachable attitude. Offering practical guidance and taking the time to understand both the needs and requirements of our business. They are happy to listen and respond to any special requirements we may have. They have an ability to understand our company and appreciate our lack of I.T skills which makes them a real asset to our business. Nothing is too much trouble and they always go that extra mile to provide a quality service. They are always at the end of a phone to answer any queries, including advice on security and iCloud, and will resolve issues in an efficient timeframe. I would just like to thank both you and your team for all your support over the years, it has been much appreciated and will have no problem in recommending your service to others. Just wanted to say thank you again for coming over today.